Case Presentation: We present a case of a 55 year old Hispanic woman with a 3 day history of abdominal pain associated with anorexia, nausea and one episode of vomiting. Physical examination demonstrated tachycardia at 110 beats per minute, and an obese abdomen that was diffusely tender, with rebound tenderness in the right lower quadrant. Routine laboratory studies revealed an elevated white blood cell count and alkaline phosphatase level. CT of the abdomen demonstrated mural thickening of a small segment of small bowel. No intraperitoneal free air or fluid was seen. After 48 hours, laboratory values returned to normal but right lower quadrant tenderness persisted. Diagnostic laparoscopy was performed and a foreign body was seen protruding through the bowel wall 100cm proximal to the ileal cecal valve. A 3cm fragment of chicken bone was removed with laparoscopic graspers and the perforation was primarily repaired. Post-operatively, the patient improved significantly and was discharged home on post operative day 1. Discussion: Bowel perforation by foreign body can be difficult to diagnose as the most common clinical presentation is of diffuse abdominal pain (67%). Risk factors for foreign body ingestion include orthodontic appliances (75%), mental illness and alcoholism. Sensitivity of CT is low, detecting only 10% of all foreign body intestinal perforations. 90% of foreign body perforations are diagnosed during laparotomy, with most pre-operative diagnoses being acute appendicitis, acute diverticulitis or acute abdomen of unknown origin. The majority of foreign body perforations are repaired with laparotomy and resection of the injured bowel with or without colostomy. 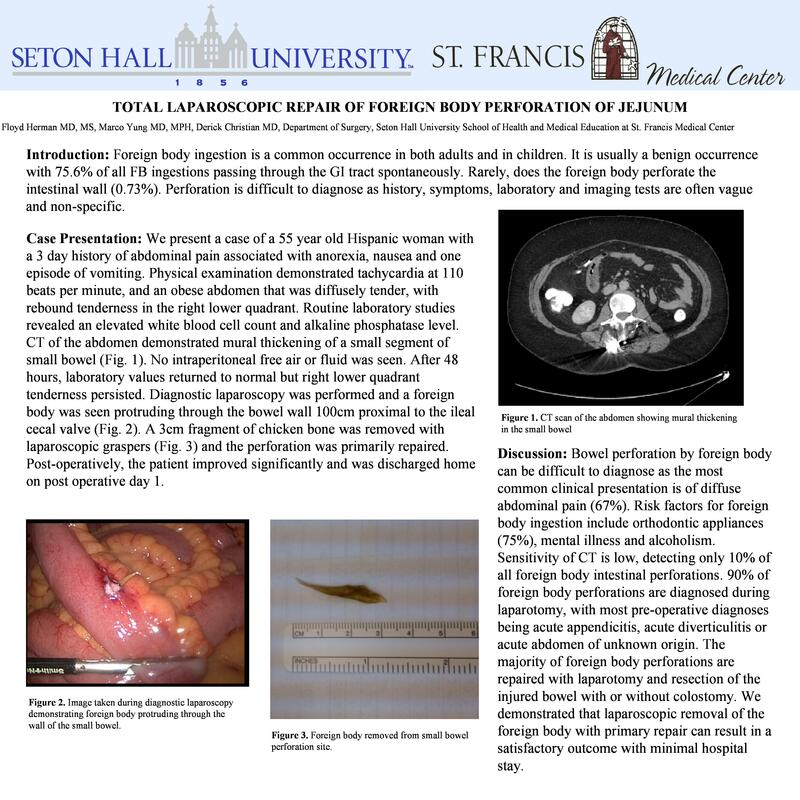 We demonstrated that laparoscopic removal of the foreign body with primary repair can result in a satisfactory outcome with minimal hospital stay.